I’m writing up a storm right now for NaNoWriMo! I’ve been sharing snippets on social media as I go, but I thought you might like a bigger excerpt today for 6 Sentence Sunday. First, an update on my progress. I’m ahead of schedule with currently 22,602 words written in November and 52,602 on the whole draft. I’ve written almost every day, except for last Friday, when I was spending time with family. I’m sharing daily updates on my progress and short snippets on social media. You can follow me on Facebook, Twitter, and now Instagram. The Mighty Pens have also done an awesome job in raising money for the Malala Fund! Right now, the team has raised over $7800! We are really close to our goal of $10K for this really important charity, and I can’t believe how well everyone is doing. We’re still accepting donations all month long, so if you can give anything, here’s my donation link. Remember, if you donate in my name, please let me know so I can send you a free copy of Riwenne & the Mechanical Beasts when it’s finished! By the way, The Mighty Pens award badges for us writers as we reach certain milestones in our word count. 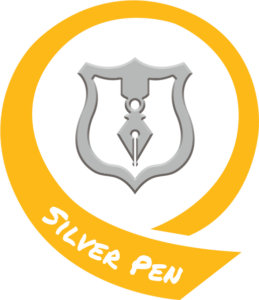 I’m up to the Silver Pen badge for 15k words! Kat and Sooz, who are running The Mighty Pens, sent me some interview questions about my book and featured it on their site. You can read a little about my experience this NaNo on their blog here. And finally, here’s what you’ve been waiting for, the 6 Sentence Sunday feature from my Nano novel. I usually have a hard time writing fight scenes, but I’ve been having a lot of fun with this book, even the fighting parts, so I’m excited to share part of one with you today. In this scene, Riwenne is fighting a giant mechanical bird when she sees that there’s a young man trapped in its claws, and she has to act fast to save him. “Hang in there, we’re coming for you!” I called to him, but he was just hanging there limply. With a cry, the bird crashed into the side of a building and plummeted toward the ground. What happened next seemed to happen in slow motion. I unslung my rifle, fired at a spring in the bird’s foot, and saw the man falling free. Somehow, I managed to drop the gun in time and opened my arms. A heavy burden landed on me and I collapsed to the ground only a moment before the bird crashed just a few feet in front of me. What happens next? Hopefully, you won’t have to wait too much longer to find out. At this rate, I should have Riwenne & the Mechanical Beasts ready to publish early next year! Stay tuned for a publication date in January!